A Virginia woman hit the jackpot of lucky streaks, winning the state lottery a total of 30 times in one day. 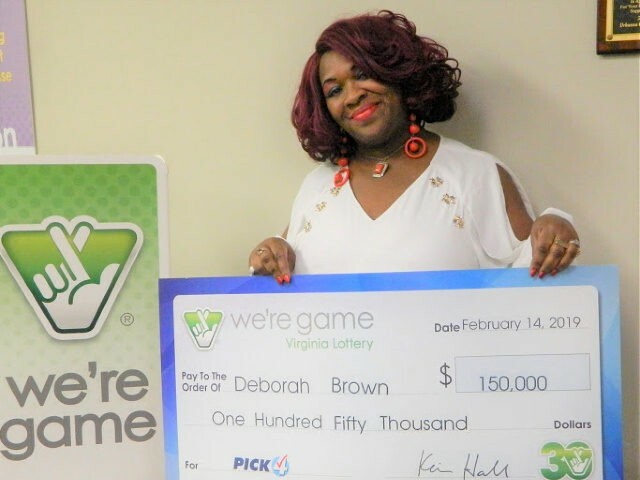 The winner, Deborah Brown, said she purchased 20 Pick 4 tickets at a gas station in Chesterfield County, choosing the numbers 1-0-3-1 on February 11, WTVR reported Friday. “A couple of times during the day, I saw those numbers,” Brown said after she claimed her prize. Brown later bought ten more tickets with the same numbers at the same location. Later that evening, each of Brown’s tickets won the jackpot, netting her $150,000 in prize money, NBC News reported. The state lottery said players have a one in 10,000 chance of matching all four numbers in the order they were drawn. Brown said she does not have “immediate plans” on how to spend her newfound fortune, but she is thinking long-term about using the money for home improvement projects. “She’s considering some home renovation,” the Virginia Lottery said in a statement.